Formed in 2001 by executives from Philips Classics together with Polyhymnia International, audiophile label PentaTone Classics was born near the beginning of SACD’s initial launch. 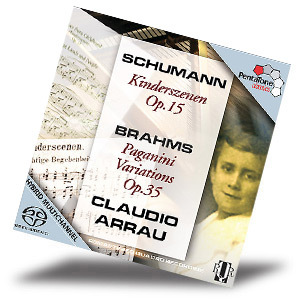 It released some of the best recordings in the then-new format and has continued to produce SACD titles that pair distinguished artistry with perfectly matched sound. The company is all about multichannel sound and hybrid SACD. Philips had already explored multichannel sound in the 1970s with their “quad” recordings, named for their number of channels, which were arranged as 4.0 (two front and two rear). They were able to make incredible quad master tapes in those days, but getting the sound onto vinyl was difficult, if not impossible. There were two competing systems for quad, and neither did a good job of recreating the sounds on the master tape. But since it can handle multichannel recordings, SACD is a natural for 4.0, and PentaTone continues to release its RQR (Remastered Quad Recordings) series using the Philips quad masters as source material. These recordings make it possible to hear legendary artists like Claudio Arrau, Leopold Stokowski, Bernard Haitink, Quartetto Italiano, Sir Colin Davis, and I Musici in recorded sound that compares with, and often surpasses, the engineering of today. PentaTone also has a series of new recordings presented in 5.1 sound and recorded with the highest standards available. The label has assembled its own stable of renowned performers, including Kent Nagano, Yakov Kreizberg, Mikhail Pletnev, Alexander Vedernikov, Sir Neville Marriner, Paavo Järvi, Pepe Romero, Julia Fischer, Vesko Eschkenazy, Mari Kodama, The Netherlands Philharmonic Orchestra, the Concertgebouw Chamber Orchestra, The Russian National Orchestra, The Wiener Symphoniker, the Deutsche Kammerphilharmonie Bremen, the Bolshoi Opera, and many others. PentaTone is pursuing a complete cycle of Shostakovich symphonies with the Russian National Orchestra and a complete cycle of Dvorak symphonies with Kreizberg and the Netherlands Philharmonic. PentaTone has also completed a set of Beethoven symphonies with Philippe Herreweghe and the Royal Flemish Philharmonic, and the label has come to the U.S. for recordings with Marek Janowski and the Pittsburgh Symphony, including a cycle of the complete Brahms symphonies. Except for a special series of historic radio broadcasts by the Saint Louis Symphony, all PentaTone recordings are single-inventory hybrid SACD. That means you can buy the same disc, whether you’re listening to two-channel Redbook or six-channel DSD. This approach seems to baffle most American companies, except for Chesky, perhaps for fear of confusing the consumer. It could also explain why, in Europe, the discs are generally known as SA-CD instead of SACD. It’s a small difference, but it demonstrates that the super audio part exists peacefully with the more familiar CD. This is one of the RQR releases that lets us hear a master musician from the past century in brilliant quadraphonic sound. Claudio Arrau was a patrician among pianists of his day, and he brings elegance, class, and lyricism to these familiar keyboard compositions. His pacing is either leisurely without being slow or fleet without being frantic, and there’s a comfortable satisfaction in hearing his performances. The famous “Traumerei,” from the Kinderszenen, is a piece that almost every pianist, amateur or professional, has taken on at some point in their studies. Arrau plays it with an infectious “just so” simplicity that could never be called indifferent. Recorded in March 1974 at the Concertgebouw, its fabled acoustics add a golden glow to sound that’s immaculately clean and clear. Kicking in the rear channels ups the presence without calling any attention to the rear speakers. L’Orchestre de la Suisse Romande, under the baton of Ernest Ansermet, was one of the most recorded orchestras from the 1950s to the early 1970s, but its recordings have since been spotty and infrequent. PentaTone has tried to change all of that by using the orchestra for a number of its recordings, most prominently a complete series of Bruckner symphonies helmed by Marek Janowski, the Polish conductor who now serves as the orchestra’s music director. 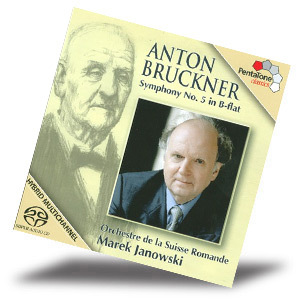 This is Janowski’s third recording in his Bruckner series for PentaTone, the previous ones being the sixth and ninth symphonies (PCT 5186 354 and PCT 5186 030). Janowski’s tempos are fairly brisk, but he manages to get across the stately and heroic nature of the music without wallowing. His overall reading is fresh, vital, and alive, and the PentaTone engineers have created a rich, warm sound with just the right amount of reverb to define the large recording space: Victoria Hall in Geneva, Switzerland. In the U.S. we often assume that all great musicians starve for their art. And while there’s no shortage of poor artists, there have also been quite a few born with money. Felix Mendelssohn comes to mind, and now there’s Gordon Getty. Yes, he’s from that family of oil barons. He’s the son of J. Paul Getty, and he’s a whiz of a financier and one of the richest men in America. But that’s no reason to dismiss his music, which has proven to be durable and quite likable. He writes in a thoroughly tonal manner, claiming that he’s two-thirds 18th century. His fast pieces are generally jolly, as in The Fiddler of Ballykeel, and the slower ones a bit wistful, as in the “Berceuse” from the Homework Suite, an orchestration of an earlier set of piano pieces. 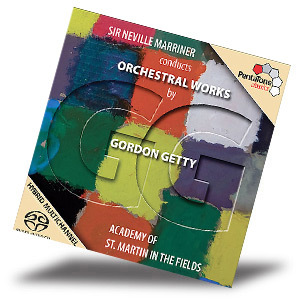 Marriner and his accomplished orchestra find all the heartfelt simplicity in this music; their performances are ideal. The pieces were recorded in a London studio, so they don’t have the natural reverberation of a concert hall, but the sound is still appealing for its clarity and excellent up-front soundstage, which seems a bit wider than in PentaTone’s concert hall recordings. Through his recordings on the Harmonia Mundi label, Philippe Herreweghe built an enviable reputation as a conductor of baroque music. Over the past ten years, the Belgian-born maestro has been leading a lot more music from the romantic period, recording the complete symphonies of Beethoven for PentaTone with the Royal Flemish Philharmonic, of which he is principal conductor. 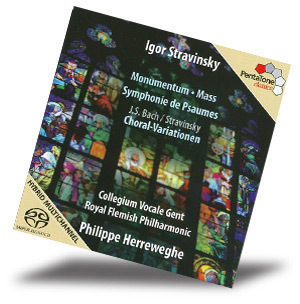 Herreweghe founded Collegium Vocale Gent in 1979, and on this recording of Stravinsky’s religious works he gets to lead both of the organizations he’s partnered with. His readings are fleet, incisive, and insightful, and both the chorus and the various instrumental combinations that accompany it turn in first-rate performances. Herreweghe’s reading of the Symphonie de Psaumes (The Symphony of Psalms) is particularly exciting. The PentaTone engineers have provided close-to-perfect sound that preserves the conductor’s clean and precise interpretations. The presence is natural, and the front stage left-right separation is ideal, as is the balance between singers and instrumentalists. There’s also just the right amount of ambience in the rear speakers. This disc is a certainly a keeper.